Many hunters do not know much about bones or the skeleton whitetail deer have under their skin. The bone structure is important when determining shot placement and also helpful when butchering your deer. The whitetail deer is a vertebrate, which mean they have an internal bone support structure to which muscles and ligaments are attached. This is the basic bone structure of all mammal skeletons. The composition of the skeleton is bone. Deer bones are made up of living tissues that are composed of cells and red blood cells are produced in the bones. 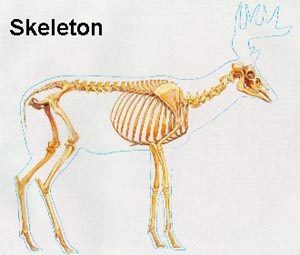 The deer's skeleton provides protection for the deer it also provides the deer's shape and movement. The metatarsal bones in a whitetail deer are the longest bones in the deer's skeleton. These bones make up the deer's lower leg. The deer's legs are perfectly designed for running and jumping. A deer walks on his toenails instead of his toes. The deer's front legs are designed to give the deer the ability to pivot quickly and easily. The back legs give the deer running power. The back leg bones fit into the deer's hip sockets While the front legs are primarily held on by bone and connective tissue. The whitetail skeleton stands between 36 to 42 inches high from the ground to the top of the front shoulder when the deer is standing.